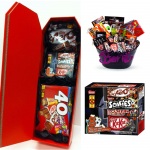 Nestlé Canada’s spooktacular Halloween treats | APEX Public Relations Inc.
At APEX we are always looking for new ways to celebrate and spread Halloween fun. This year we worked with Nestlé Canada to create something simple, spooky and delicious for Halloween. We transformed of Nestle’s Halloween favourites — SCARIES, ScAERO, KIT KAT and COFFIN CRISP — into perfect Halloween treats that played up the spooky factor for the occasion. 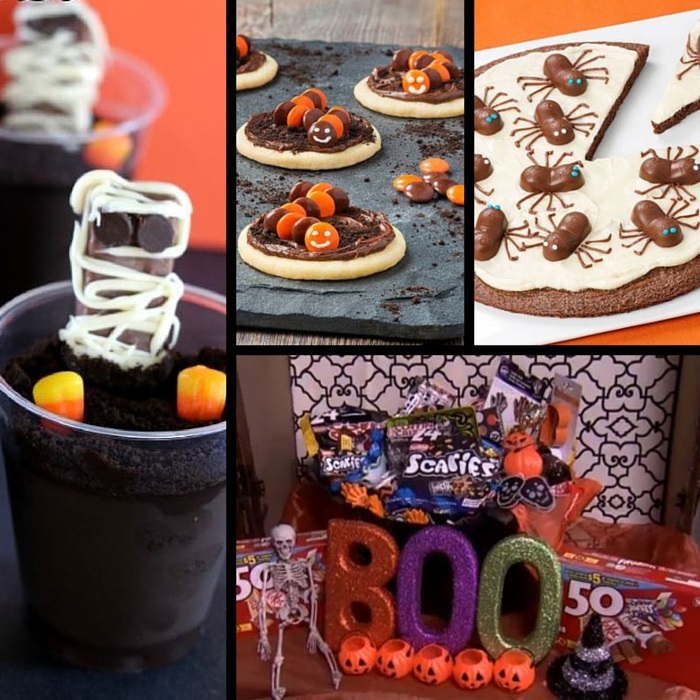 We were thrilled that Chocolate Mummies, Witch’s Brew Cupcakes, Creepy Crawler Cookies and Spider Brownie Pizza were a hit with bloggers, television shows and journalists alike – even inspiring some of them to create their own recipes! Line a rimmed 12-inch (31 cm) pizza pan with parchment paper; set aside. Prepare brownie mix according to package directions, spread brownie batter in pan and bake for 15 to 18 minutes or until tester inserted 1-inch (2.5 cm) from edge of pan comes out clean. Cool brownies completely. Spread with cream cheese frosting. Arrange 12 ScAERO Snack Size Bars on top, leaving about 3-inch (7.6 cm) space between each. Add chocolate frosting to a small resealable bag; snip corner. Pipe frosting around each bar to resemble 8 spider legs. Pipe 2 dots on each spider to resemble eyes. Place Nestlé COFFIN CRISP Snack Size Bars on a baking tray lined with parchment paper, leaving 2-inch (5 cm) space between each. Cool melted white chocolate slightly. Spoon into a medium resealable bag; snip corner. Pipe 2 dots on each Nestlé COFFIN CRISP Snack Size Bars for the mummy’s eye. Adhere a mini dark chocolate chip to each to complete the eyes. Drizzle remaining white chocolate over bars to resemble a “wrapped” mummy look. Prepare cake mix according to package directions to make 24 cupcakes, fitted with Halloween-inspired liners. Cool cupcakes completely. Cauldron handles: Place melted chocolate into resealable bag. Snip corner off to make 1/8-inch opening. Onto wax paper lined baking sheet, pipe 48 C-shapes, about 1-inch in size. Refrigerate for 10 to 15 minutes until set. Scoop about 1 Tbsp. (15 ml) cake from centre of each cupcake, leaving 1/4-inch border around edges. Mix vanilla frosting with food colouring to desired shade of green to resemble a witch’s brew. Spread a heaping tablespoon into centre of each cupcake letting some ooze over side. Spread sugar pearls onto plate. Dip each cupcake in pearls to adhere. Place two chocolate C-shapes onto each side of cupcake to make handles. Break each KIT KAT Snack Size Bar in half. Insert one bar into top of each cupcake for the witch’s stirring spoon. Prepare sugar cookies according to package directions for cut-out cookies, cutting cookies with a 2 1/2-inch (6.5 cm) round cookie cutter. Cool cookies completely. Spread 2 tsp. (10 ml) chocolate frosting on each cookie. Sprinkle with 1/2 tsp. (2 ml) cookie crumbs to look like dirt. Standing vertically and slightly overlapping, arrange one package of Nestlé SCARIES Snack Size Bars, alternating colours, on each cookie to resemble a worm’s body. Add vanilla frosting to a small resealable bag; snip corner. Pipe 2 eyes and a smile on the first SCARIES of each cookie for worm’s face.